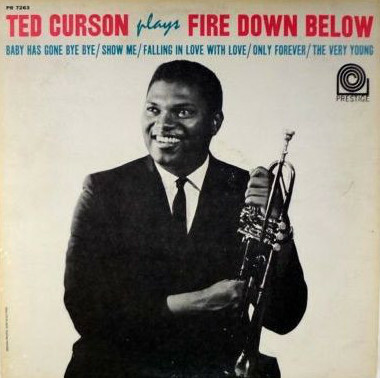 It is really very nice to have a possibility to read some well-written and full of heart and presence reviews on such rare gems as “Ted Curson Plays Fire Down Below” – for sure – is. I am reading the FLOPHOUSE reviews with great pleasure, mostly. Maybe sometimes I am not able to agree with some of your points of view, but even then it is obvious that you have your point of view built, and it is something for respect. I am writing this reply with hope that in some (not too far) future you will write also something about other Ted Curson’s gems as “Tears For Dolphy,” “The New Thing & The Blue Thing,” as well as “Urge” are, all of them from mid-1960s. I strongly believe that the front line of Ted Curson and Bill Barron was the mighty, although highly underrated, combination that made some excellent music that will last forever. Hi Slobodan, much obliged! Thank you very much for your kind and considerate comments. Your outlook is much like mine. Give people with strong views respect, listen, ‘hear’, ‘doubt’, sharpen your wits… Jazz is the shared language. I’ve got Bill Barron on my to-do-list. Underrated! Keep swinging, Slobodan, cheers.